Summary: A status update on what you shouldn't put on your Facebook page. 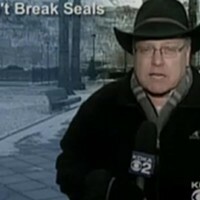 Reporter: John Shumway, KDKA Channel 2 Airtime: 4 minutes, 23 seconds on Nov. 18 Highlights: * When anchor Ken Rice warms up: "Social networking is quickly becoming a primary form of communication. ... It's also, though, becoming a common tool of the criminal element, and you might be unknowingly helping them rip you off. 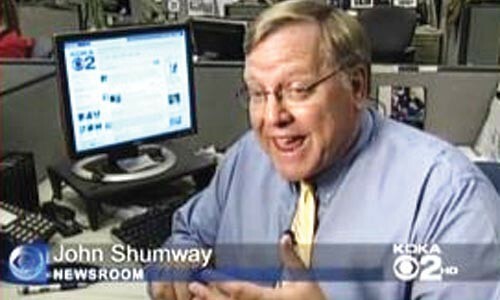 John Shumway's here with five things you should never put on Facebook." * When Shumway reveals, "[They] are: your home, your children, your credit cards and your money." I counted four. You? * When a Bellevue woman, seated inside a busy coffee shop, says, "I do like Facebook because it allows me to stay connected with family and friends out of state." * Shumway's lament: "If only it would stop there. But there are so many others out there and watching." * When FBI agent Michael Heiler tells us the audience includes "[n]ot only fraudsters and criminals such as those that might rob your house, but you have child predators." * When Shumway gets to the point, nearly a minute and a half into the story: "So here they are, one, two, three, four and five what you never want to put out there in the social-networking world." * When Shumway begins "Number one," cueing film of the Bellevue woman, who states, "My birthday is out there." * When Shumway warns, "And [creditcard fraud] can happen even if you just put your birth date, not the year." * When he adds, "Number two: your child's birth date. It can also be used for obtaining credit. But it's worse. Because your child is rolling through their school years, whoever checks their name for a credit report?" * When a man in an Oakland coffeehouse explains, "Like when we go to Cincinnati or something, you know, I'll say that, you know, I'm in Cincinnati, just, you know, [unintelligible; I give up]." * When Shumway chimes in, "Bad idea. Never put travel plans on Facebook. Not even short trips." * When Shumway continues, "Let's move on to number four: Never put your address on Facebook. You might as well put a sign in the front yard, 'robbers and pedophiles welcome.'" * When Shumway cautions, "And finally, number five: Never mention your mother's maiden name. ... It's almost like a password to your financial life." Unanswered Question: What's on your mind? What We Learned: Be nice to your mother. She knows your password. News Value: 3. These are mostly pretty common-sense things, so I'm not sure what all the fuss is about. When searching for statistics on Facebook crimes, I actually found more stories about how law enforcement is using social media to fight crime. Mr. FBI Man didn't mention anything about that, did he?